There are restaurants and eateries all over Pittsburgh, although unusually, the downtown district is not really the place to come if you are searching for fine dining. 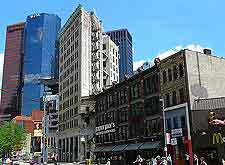 Instead, downtown Pittsburgh is filled with many rather bland steak houses and restaurants, which cater almost solely to the tourist market and also appeal to nearby office workers. If the world of food and dining, Pittsburgh has a couple of outstanding gastronomical 'claim to fames', being the city where the world-famous Heinz tomato ketchup was born. Also of interest, in was here in this very city, when in the mid-sixties, one of the local McDonald's restaurants invented the very first Big Mac, which was later rolled out to all chains soon after. If you are based within downtown and are simply too hungry to look further afield, then there are a number of good restaurants amongst the endless touristy dining options. Look to the Penn Avenue and around the Strip, where DeLuca's is said to serve the 'best breakfast in town', and My Ngoc is well known in Pittsburgh for its Asian fare. 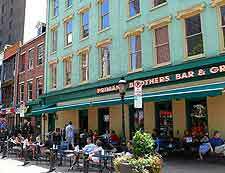 There are also a handful of noteworthy restaurants, pubs and taverns around 6th Street, Smallman Avenue and the Market Square. South Side has become the culinary capital of Pittsburgh and is brimming with quality restaurants and unlimited opportunities to enjoy fine dining at a sensible price. The South Side's Carson Street is overflowing with eateries of all descriptions, ranging from cafes and diners, to tea rooms and coffee shop chains. 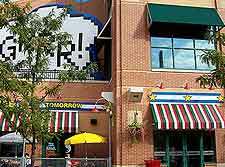 Those based in the North Side of Pittsburgh will find budget restaurants providing cheap eats close to the baseball stadium of PNC Park on Federal Street, and the Heinz Field football stadium on Art Rooney Avenue. 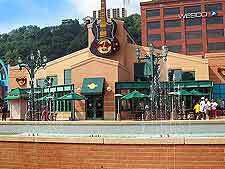 For spicy dining in Pittsburgh, then check of the scene around the East End district,m where a number of acclaimed Indian restaurants reside, while shoppers in Arlington will no doubt enjoy lunch at the Hard Rock Café in the Station Square complex on West Station Square Drive.